This class will focus on workshopping your poetry, based on the idea that reading your work aloud and responding to the work of others—is integrally tied to the development of writing. We’ll talk about how to find your voice, how to hear and honor your own internal dreams and visions, how to value your own work and put yourself first. The skills of listening to critique and offering comments that are specific and based on craft will be emphasized. Tuition includes a copy of Voices from the Attic, the annual anthology of creative writing by the Madwomen in the Attic, published by Carlow University Press. About the instructor: Lori Wilson has been a member of the Madwomen in the Attic since 2007. She is the author of the poetry collection, House Where a Woman (Autumn House Press, 2009). Her poems and reviews have appeared in literary journals such as Women’s Review of Books, Southern Poetry Review, Salamander, Kestrel, Cerise and 5 AM. A 2012 recipient of the Mid Atlantic Arts Foundation Creative Fellowship at the Virginia Center for Creative Arts, she holds an MFA in Poetry from Drew University and lives in Morgantown, West Virginia. All workshops are open to beginning through advanced writers. Space is limited to 12 writers per workshop. WV Writers member Debbie Richard has just had a new poetry collection published called Resiliency. The collection is now available through her website, Amazon.com as well as through the publisher Finishing Line Press. "Resiliency captures the essence of the poet's life and her communities. Through uncomplicated prose, she takes us into her memories and holds us there safely, until we're ready to reflect on our own." "Debbie Richard's poetry collection, Resiliency, takes the reader on a tender descriptive journey through place, past and present. Firmly rooted with family and the South, the reader will find this collection both accessible and familiar." It is the moment each week that I usually sit back, recheck the words you are about to read and consider hunting down some other little tid-bit to add in. I say usually because for the last three days I have been battling all aspects of communication on my computer. Downed internet, unloadable social pages, glitchy e-mail, and a website that needs updated but has been sitting on 90% loaded …again… for the past five minutes. The actual laptop beastie is doing just fine within itself; it just won't let me out of my little world without a battle. If you are wondering why I'm whining about my technology woes in your busy ears, it's because this strange partial exile from the digital world has really shined a spotlight on how much I rely on the interactions displayed on my screen. Whether it's one-on-one conversations, large group messages, or that lurking thing we all do through blogs and pages, technology eases our ability to connect with others of like mind or thought stretching diversity. Thank you for adding your own bits and pieces here to help each other find connections to new events and diverse opportunities. In this age of technology creating a second reality that is invisible until you log in, it is nice to know that West Virginia Writers, Inc. has so many great writers sharing their words and helping to shape the invisible into something beautiful. Just in time for Christmas comes this collection of five stories from former West Virginia Writers President. 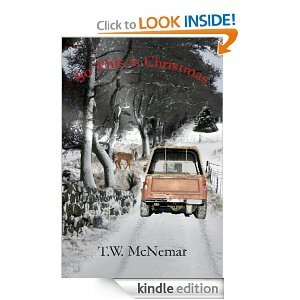 Terry brings his trademark Appalachian voice to these stories of War Vets and Christmas. So This Is Christmas is a five-short story collection of based around the Christmas season. Inspired by family and friends who have served in the United States military in various wars, I borrowed a line from the 1969 song, Happy Xmas, War is over to send this out. The only non-veteran tale is a short piece of a coming of age story that adds a bit of comic relief. As you may have guessed, these are not light-hearted Christmas stories. This is a look at life that just happens to occur during Christmas in West Virginia. I hope these short stories inspire you the yearlong. Merry Christmas! Pick up your copy today from Amazon for $1.89, or if you are an Amazon Prime member, you can borrow it for free. Share it with a friend! If you've ever attended a writers' conference or enrolled in a creative writing course, you've probably heard those words. Now while this phrase makes for good advice, it also makes for a boring story. Every writer or author will eventually come to a time when he needs to write about something of which he has no personal experience. For instance, some of the world's greatest writing typically involves the subjects of life and death. Death? That is another story altogether. Since most of us have never killed anybody and none of you reading this have ever been dead, then writing about these matters will require much more than a little imagination. Moreover, there are many other interesting topics about which you may choose to write and you are largely unknowledgeable about those things as well. That is where it helps to have a source. This came to me the other day, while reading a post by one of our members. In my earliest years as a writer, I often felt lost and alone, unsure of how to proceed in this strange, brutal, and unforgiving business. Not only did I determine that I would ultimately succeed in my desire to be a multi-published author; I also determined, if I did succeed, then I would become a friend and mentor to other struggling writers. Therefore, I am hereby offering my services. Whatever few skills and insights I might have, those I am willing to share with other up-and-coming authors. Growing up on a farm, I know a good bit about farming and raising cattle. My study of history has given me some special insight into our nation's past and those who made it happen. Thirty years in manufacturing have educated me in chemicals and lab equipment, some of which are also used in forensic science. My interest in recreational shooting has given me an extensive knowledge about firearms and ammunition. And as an avid hunter, I have occasionally seen things die by my hand. Moreover, the fact that I have been married to the same woman, the love of my life for over thirty years, has given me the special insight that I know absolutely nothing about women. Although I by no means consider myself an authority on anything, I am a devoted student of those things that interest me. And I'm more than willing to share what little bit I know with other writers who ask. I've also learned that every single person is an expert on at least one thing. And everybody knows something I do not. In the days and months to come, I will be acquiring a list of members, people who are knowledgeable in unique and specific areas, those who are willing to share their expertise with others in our organization. Do you have a specific and unique knowledge of something? Are you willing to share that knowledge with others? And would you allow me to add your name to this list? You may not always be able to know everything you wish to write. However, with the help of your fellow authors, maybe we can provide you with a quick and available source for that knowledge. To all of our members who have achieved their recent writing goals! 2) Robert Yoho brought up a very good idea on Facebook. He is suggesting putting together a list of people who are willing to share their expertise in various subjects. I can't think of a better place to begin this process than here in your e-newsletter. As Mr. Yoho put it: "Long ago, I learned that every single person is an expert on at least one thing." If you are willing to share your expertise, please feel free to send your contact information to Robert Yoho on Facebook (or you can e-mail to wvwnewsletter@gmail.com and we will be sure to get the information to him). Don't forget to check out the new section in the e-newsletter too. No matter what you are writing about, someone may have just the piece of information that will take your words from "that's nice" to "OH! WOW!" 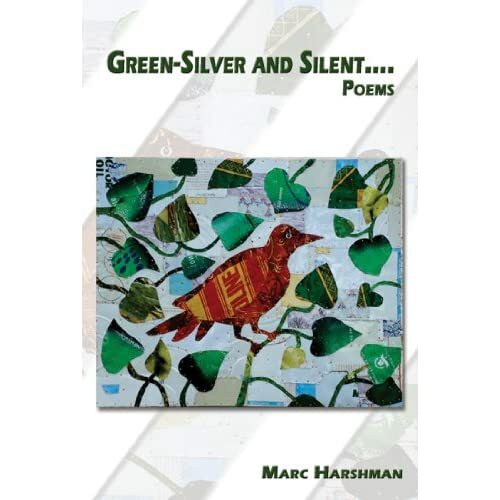 West Virginia Poet Laureate Marc Harshman will be autographing books, including his new book of poems, "Green-Silver and Silent," at Taylor Books in Charleston – Thursday, December 20th, 5 – 8 p.m. Joining him will be author Colleen Anderson whose wonderful new children’s book is just out this year, too. 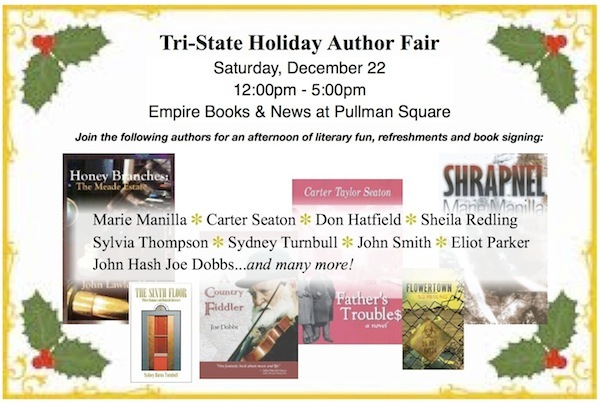 For those further north, he’ll be doing a reading and signing at West Virginia Wesleyan on Saturday, December 29th at 6:30 p.m. there.